Skyscrapers puzzles can be played interactively on the computer, offering many features and advantages compared to pencil and paper. This section explains everything about how to play Skyscrapers on the computer. If you are not yet familiar with the puzzle rules, please go to Skyscrapers rules. 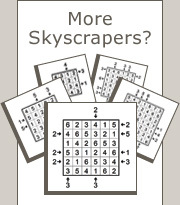 Skyscrapers interactive is played by placing numbers in a grid. Click mouse on the desired square to open dial pad and then click on the desired number. To remove a number, repeat the above using X at the bottom of the dial pad. Numbers can also be placed by pointing mouse on the desired square and then typing with the keyboard. Skyscrapers interactive also supports pencilmarks to help solve hard puzzles. Click mouse on the desired pencilmark square to open dial pad and then click on the desired number. To remove a pencilmark, repeat the above using X at the bottom of the dial pad. Pencilmarks can also be placed by pointing mouse on the desired pencilmark square and then typing with the keyboard. Highlighting skyscrapers is helpful to see how many buildings are visible when viewed from the direction of a clue. To highlight skyscrapers in a row or a column, click mouse on the desired clue. Check all placed skyscrapers for errors. Show conflicts: Check this box to automatically show conflicting skyscrapers during the game. A conflicting skyscraper means an identical building already exists in the same row or column. Open Skyscrapers Interactive page you are reading now. Attempt to reduce to page: Check this box to fit large puzzles on a single page. When this box is unchecked, large puzzles will print in multiple pages according to selected scaling. Attempt to enlarge to page: Check this box to fit small puzzles on a whole page. When this box is unchecked, small puzzles will print according to selected scaling.